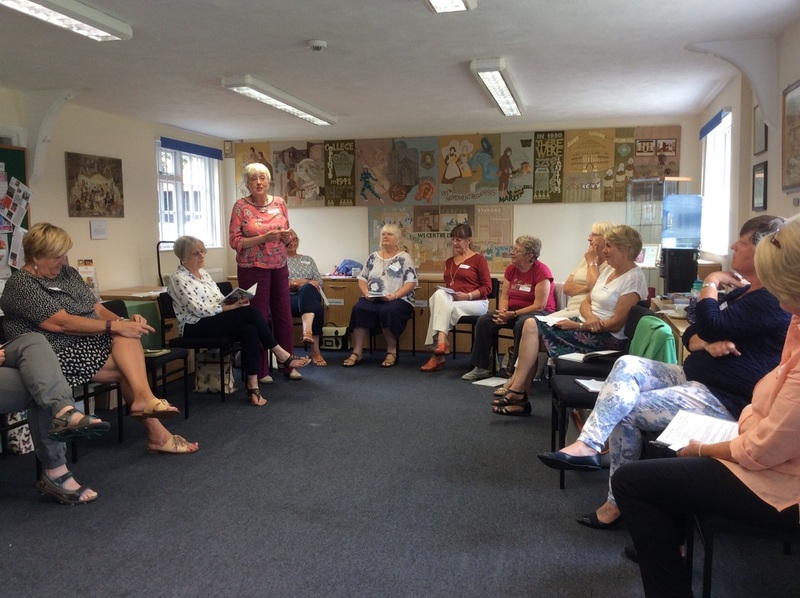 Angela K and I spent a day at Essex Federation HQ in Hatfield Peverel on Friday 29 July learning how not to be terrified of getting up in public and speaking out. Now, you might think that neither of us seem in particular need of instruction in that but in truth, depending on the audience, I'm quaking and my insides go to water - and Angela admits to a similar lack of confidence. In fact, lack of confidence was the reason for all 12 WI members to participate in the course. This was taken by three WI advisors (including Tricia who was Wanstead WI's very first advisor). The participants came from all points of the Essex Federation including our own area advisor Andrea Neale, extending her training. We started with an ice-breaker, finding out from your neighbour who they were and their reason for being on the course - and then having to relay that information to the group. My partner, Linda was the new secretary at Halstead and felt insecure at getting up to speak in front of 100 WI women while Angela's buddy was three-time president of three different WIs (currently at Maplin near Burnham on Crouch) and still felt she lacked confidence to speak in public. We practised various breathing and relaxation exercises plus tackling some tricky tongue twisters - try saying "rubber buggy bumpers" quickly! We then had various tasks; how to give a vote of thanks at a WI meeting based on a person's name and the title of the talk. One woman had never given a vote of thanks but did so faultlessly when her turn came. Then how to 'sell' an event to your own WI so that it sounds as exciting as it truly is and the information registers. Finally we had to read a short passage aloud - not as easy as you might think to engage the attention of your audience and keep it. We ended with a general talk sharing feedback and realising just how much we could do and how much we'd learned. As you can imagine there was lots of chat and opportunity to get to know the others. So the bonus is that we can look forward to WI pub lunches out in the countryside - they're not as far away by car as you think up the M11 or A12. Anyone for a ploughmans? ​Earlier this year Angela K and I spent a productive day at an Essex Federation workshop at the HQ in Hatfield Peverel. 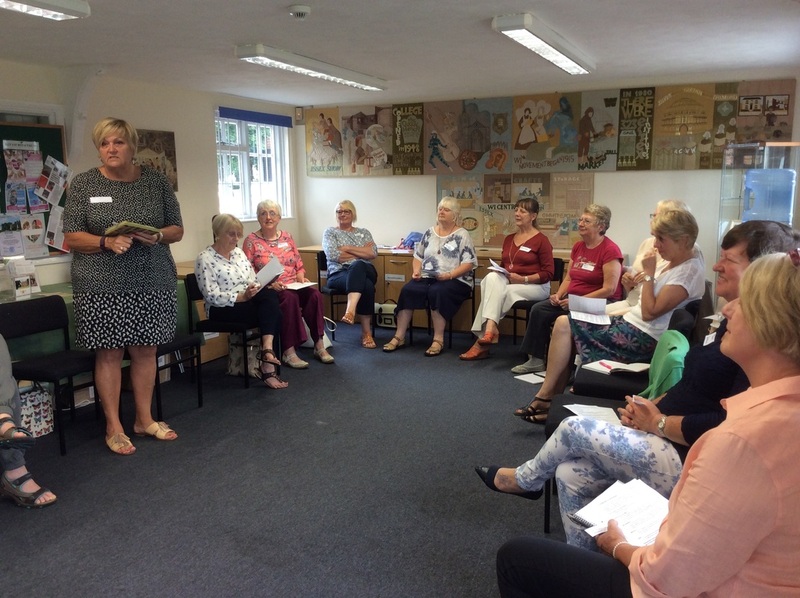 Together with sixteen other members of various WIs in Essex attended a workshop on Getting to Know Your Sewing Machine. We started the day by learning to thread our own machines then undertook a series of exercises designed to teach us about the various stitch options available on our machines. The remainder of the day was spent making a lined bag with a zip pocket on the inside. All the fabric was provided pre-cut, so we could get straight on to machine sewing. The friendly and knowledgeable tutor explained what we needed to do and demonstrated the insertion of a zip and assisted everyone individually, as needed. The faster sewers even managed to use their machines to make buttonholes! We were able to complete our bags by the end of the day – very satisfying and highly recommended for those who are uncertain about using their sewing machines.